Focus on efficient energy generation. Regular maintenance is required so that cutting-edge technologies deliver top performance. This does not just involve replacement and repair of components but, in particular, thorough cleaning of each component. Downtime is lost time. Especially with the cost-intensive capital goods of the energy industry, the conflict of objectives in maintenance is between a minimum amount of time required for all maintenance activities and their error-free and conscientious fulfilment according to predefined standards. The company works with a cleaning system in which all attachments are cleaned. Most importantly, the varying nature of the individual parts presents a great challenge. In terms of cleaning, it is therefore important to optimise one single process for handling a wide variety of metals and alloys. The previous approach paid the price for these high demands: During maintenance work, a total of four products from a competing provider had to be used. Only in this way was it possible to ensure rust removal, thorough cleaning and protection against future flash. Therefore, it was necessary to carry out a targeted analysis in terms of the efficiency and environmental friendliness of the maintenance process. Caramba showed the customer during the consulting how they could halve the number of products used. Using the rust remover Caramba I-Line XS-15, it was possible to effectively remove the rust from all the parts and clean the system itself at the same time, even at a low concentration of 3-4%. The desired cleaning result was also exceeded by using the basic cleaner Caramba I-Line AD-30 (5%). By adding this to the rinsing bath at a concentration of 2%, this also took on the role of an additional corrosion protection agent that had been previously used. In addition to an optimised cleaning result, a significantly more efficient product use was achieved at the same time: Instead of using four components now only two are used. Both the basic cleaner Caramba I-Line AD-30 and the rust remover Caramba I-Line XS-15 can also be used at lower concentrations than the products previously used. 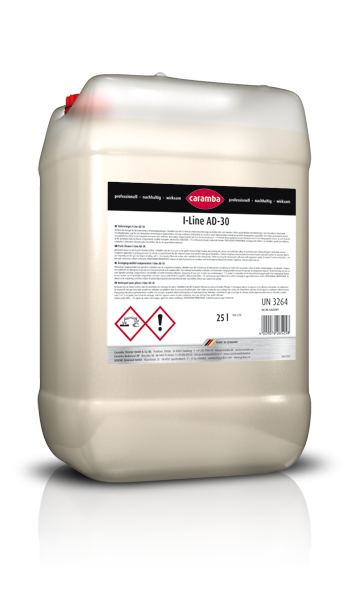 The highly alkaline cleaner I-Line AD-30 makes it easy to remove even the heaviest contamination and dried-on oil. Its particularly low-foaming surfactants ensure problem-free use in spray procedures. Oils removed are demulsified and can be easily removed using an oil separator. 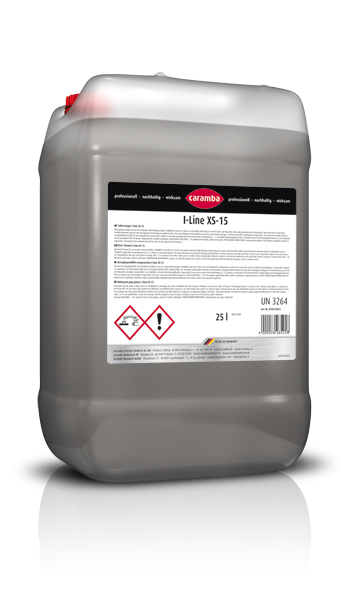 Caramba I-Line XS-15 has a wide range of applications and is ideally suited as a basic system cleaner and decalcifier for industrial parts cleaning systems. In addition to being used in circulation, Caramba I-Line XS-15 can also be used as a high-pressure cleaner. Caramba I-Line XS-15 removes deposits of scale, lime and oil as well as oxide residues from containers, production systems, walls and floors without leaving a trace.